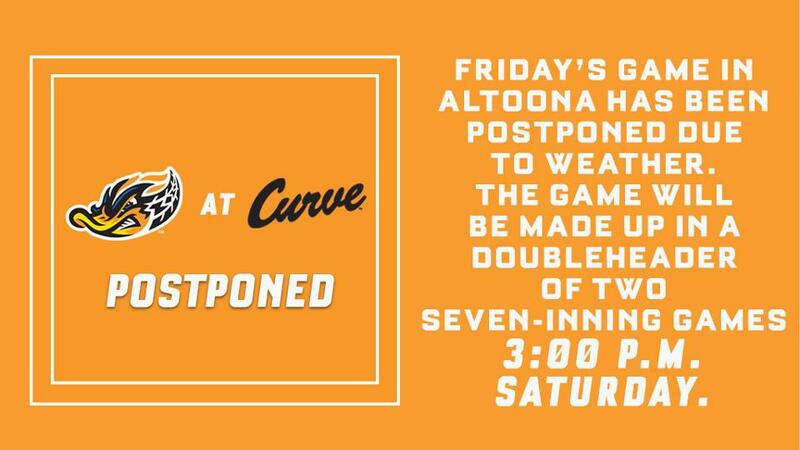 Rain postponed Friday's game between the Akron RubberDucks and Altoona Curve at Peoples Natural Gas Field in Altoona. The game will be made up in a doubleheader of two seven-inning games at 3:00 p.m. Saturday. The RubberDucks continue the series in Altoona with Saturday's doubleheader at 3:00 p.m. EDT. In Game 1, RHP Zach Plesac will start for Akron, and RHP Scooter Hightower will start for the Curve. In Game 2, LHP David Speer will start for Akron, and RHP Pedro Vasquez will start for the Curve. The doubleheader will be broadcast on Fox Sports 1350 AM, the WARF iHeart channel, and the TuneIn Radio App.